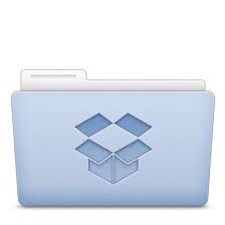 I'd like to share some more quick tips for Dropbox, specifically Dropbox on iOS devices. Report card period is upon us teachers once again. I am the French specialist at my school, and I thus have to give marks to all fourteen different homeroom teachers. I use Numbers (which syncs nicely between my iPad, iPhone and new MacBook Pro) to calculate all the marks, and then I quickly transfer the individual classes to a Word document. I print out the pages and hand them out to each teacher. I save all my non “iWork” documents to Dropbox (my iWork documents save automatically to iCloud). After saying I would email the class list if marks to her that evening, I quickly thought of a better way. I knew that I had saved it on my Dropbox. I located the file and opened it. Then I pinched to zoom it to fit the screen. You can see in the shot above that I simply sent it to her via iMessage. The whole process took about thirty seconds, all while I was waiting in line to purchase some clothes. She was then able to view the photo as a full screen on either her iPhone or iPad, and thus continue inputting the marks. Both of us saved time. 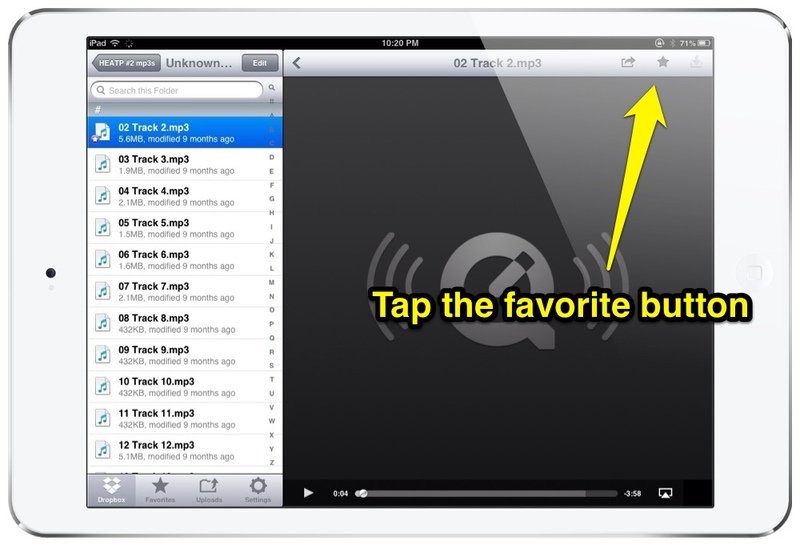 Are you tired of having your music mp3s go through iTunes all the time? Do you hate having to always sync your music by connecting via usb to your computer? I know that I have previously mentioned iTunes Match (a service which I love by the way), but if you need to quickly access some mp3s already stored in your Dropbox, simply locate the file and tap the star. That file will now be saved locally onto your device for offline viewing (or listening, in this case). You can choose as many songs as you wish. Create a playlist of songs that you might use for teaching. Now you don't have to worry about iTunes if you don't want to! Note, the above tip will also work for video files as well. Your favorites are separate for each iDevice you own, and any of these files can be viewed offline (without an Internet connection). This may come in handy if you commute each day and you want to listen to your latest album or view a movie while on the bus or train. Setting up shared folders in Dropbox, to my knowledge, can not be done from an iOS device. I'm pretty sure you need to do it on your browser on your computer. Check this article if you want to further learn how to share folders on Dropbox. I have shared multiple folders with multiple different people. From teaching tips and lesson plans with other teachers to music sheet music with other musicians and students, sharing has been an invaluable tool for me. No more need for large attachments over email! If you want, you can simply share individual files by sending anyone a link. They will have the option, once they open the link, to either open the file immediately or download the file into their own Dropbox. Have a new photo album? Set up a shared photo album with family. As time goes on and as you continually add photos to that folder, your family and friends receive them immediately (no need to download). Just downloaded the latest album from your favorite artist? Let your friends take a listen and see if they like it. Want to share videos that you like? Perhaps you have a great video for a unit and you want to share it with your colleagues who teach the same topics as you. They will benifit from your research! Sharing goes both ways: people that you share with may also add files to the folders. This is a great way to collaborate! Everyone is able to edit, make any changes, or create their own content within the folders. In that regard, remember that you can always track changes and revert to previously saved versions using the Dropbox website. You can even restore deleted files. So don't worry if someone accidentally deletes anything. There is no limit in the number of people that a folder can be shared with. I am part of a large group of language teachers around the world who share resources: worksheets, PDFs, powerpoints, etc. Can you tell that I love Dropbox? Let me know if you have any other tips you chave to share in the comments! Previous Post Question: Which iPad should I get?